In a heavy-bottomed pot with a lid, melt the butter over medium heat. Add the sliced sausage and cook, stirring often, for 5 minutes. Add the paprika, cumin, cayenne, black pepper, and salt, and cook, stirring often, for 1 minute. Add the tomatoes and cook, stirring for a few minutes to let some of the liquid from the tomatoes evaporate. Add the green bell pepper, celery, and most of the green onions (reserve some of the onions for garnish). Cook, stirring occasionally, for 5 minutes. Stir in the brown rice and mix well. Add the chicken broth, increase the heat to medium-high, and bring the mixture to a simmer. Reduce the heat to low, cover the pot, and cook for 45 minutes. Remove the lid and check the rice. It should be just tender; if it is still too firm cook longer. When the rice is tender, stir in the shrimp, cover, and cook for 5 minutes, or just until cooked through and no longer translucent. Taste for seasoning and adjust if needed. To serve the jambalaya, spoon it into individual serving bowls with green onions sprinkled on top. 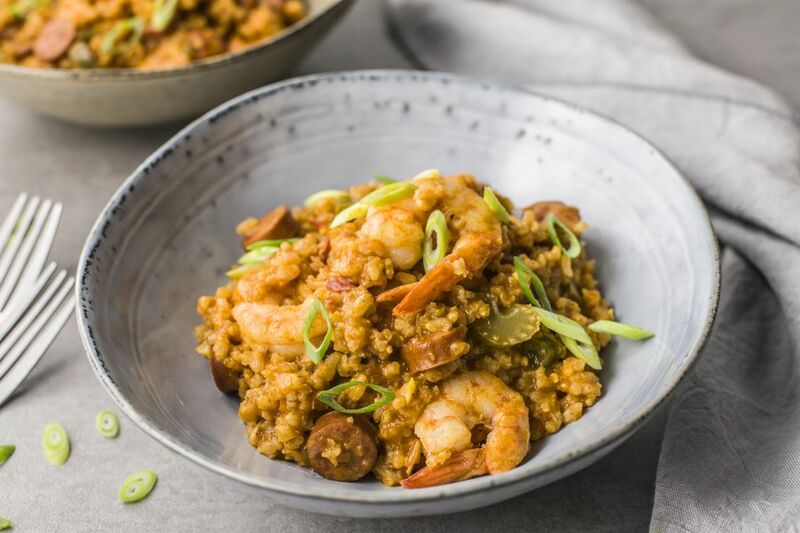 Jambalaya makes a great one-pot dish. To round out the menu, serve with warmed cornbread or a French baguette and a tossed green salad. Use long-grain white rice instead of brown rice, but be aware you will need to check the recipe after 20 minutes, as it cooks much faster than brown rice. Andouille sausage is a French-Creole smoked sausage made with pork and spices. If you can't find Andouille, any spicy smoked sausage, such as chorizo or kielbasa, can be substituted.